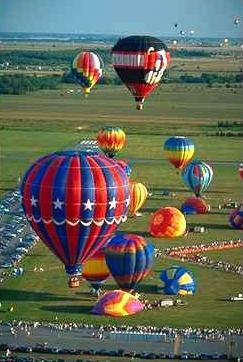 This article is addressed expressly to experienced balloonists, (pilots, crew and friends). The information in the article is presented as information concerning possible hazards. Discussion of hazards is an effective way to reduce or eliminate their occurrence. Unfortunately, the frank presentation of facts could create the wrong impression to new enthusiasts. The actual incidence of the type of accident specifically referred to in this article is perhaps one in one-half million operations. However, the gravity of this accident is such that any incidence of this accident is unsatisfactory. Traditional hazards of fire and powerline collision can be even more dangerous if your balloon envelope has a self-closing deflation valve. Fatal accidents have occurred where the balloon envelope was uncontrollably heated by a large on board fire, thereby resulting in a more serious accident than the fire alone might have created. Self-closing valves require constant restraint to deflate the envelope. Pilots and crew cannot, in every case, function continuously during a large fire to insure that the balloon envelope deflates as fast as possible in order to reach the safety of the ground. The inability to exhaust the envelope heat created by a large on board fire causes the envelope to ascend to altitudes beyond the safe level which the occupants can abandon the balloon. There may be a number of methods to overcome this problem. Certainly a system of securing the valve line in an open position together with a fire resistant (steel core) line are the principal areas which need study. Many good ideas will be advanced as corrective measures, and a few will be produced as actual hardware. However, hardware is not the purpose of this article. My purpose is to make the reader aware of the problem and the obviously serious results. I am not advocating that the self-closing deflation valves, available from almost all balloon manufacturers, be shunned as dangerous. I have maintained for a long period of time that in terms of overall safety that the self-closing valves are inherently superior to valves which cannot be reclosed by the pilot while in flight. The safety of nonreclosing valves has been very good; however, the basic reasons which caused serious accidents with nonreclosing valves still exists - only constant attention to maintenance details cause them to be safe. Prevention of the circumstances that cause massive on board fires is the obvious best solution to the problem. The three accidents of which I am aware involving on board fires, self-closing deflation valves and fatal conclusions had different original circumstances. The original cause of one accident was a break in the main fuel system piping. Two accidents were caused by rupture of the fuel system from power line collisions. Balloon fuel systems are not well protected because the design must accommodate the necessity to remove major components of the system for storage (i.e., burners, tanks and hoses). Some manufacturers have better designs than others; however, there is no current design which fully protects the fuel system from all the possible abuse which can occur in balloon operation. Ultimately, the pilot must take responsibility for the safety of the fuel system. The area of greatest concern is that the system resist a major fuel line or valve break. A major leak in a high pressure propane system is an opening approximately twice the diameter of a common pin. It is important that fuel hose arrangements be protected from the balloon occupants particularly at connections to tank valves. Short pieces of pipe associated with quick disconnects at the tank valves or for any other reason must be carefully protected (usually by rotating the tank until the fitting is protected by the gondola structure) from heavy body contact by the pilot or passengers. These short pieces of pipe act as levers which multiply the force of the blow on the valve body. It is possible to break tank valves in this manner. Brass fittings have only 1/2 the strength of steel for an equal thickness; therefore, these fittings are the most suspect and require special attention. Fuel tanks can be burned through by arcing powerlines. It is unlikely that a pilot can do much to protect tanks from this exposure except by avoiding powerlines. The hazard of powerlines is generally accepted as ballooning's greatest danger. Contacting powerlines below the equator of the envelope will generally result in burning through the flying wires as the envelope drags the gondola over the wires. If contact is made at or below the superstructure a good chance of a fuel tank or fuel line rupture exists from powerline arcing. Neither of these alternatives is acceptable. Powerline contact above the equator is much less hazardous because the balloon will be forced to the ground by a combination of the obstruction and wind force. Thermic conditions may complicate the last option. Obviously the best way to promote your personal safety (including passengers) is to avoid powerlines. Avoidance of powerlines, while highly desirable, will not always be possible. Each of us will at some time in our balloon flying career make a serious inflight decision about powerline contact. This decision will be hard, perhaps terrifying and very serious. Knowing that collision with a powerline must occur in a precise way in order to minimize personal injury is a big part of the decision criteria. Acting quickly is also necessary. The decision involves "burn" or "rip". Emotionally, all pilots will want to "burn" because if you can fly over the wires - missing them completely - there are no complications once safe passage occurs. The nagging problem is predicting absolutely that you can clear the powerlines. On the other hand, ripping is a safer decision because there is almost no chance that the envelope will contact the powerline incorrectly, i.e. below the equator. The problems with ripping are numerous; however, these problems are not as likely to be fatal. a. The pilot's ego may be severely wounded because there is the possibility of criticism for over reacting. On the other hand, it may be nice to be alive and capable of personally discussing this criticism. b. The balloon envelope may sustain damage from the power lines. Consider the fact that your insurance company will be very pleased to pay for envelope damage as opposed to passenger liability. c. There is a chance that there could be injury to the pilot or passengers. Properly prepared for a heavy landing there is really very little chance of serious injury. A balloon ripped from 150 feet cannot exceed 1500 feet per minute descent rate. Landing at 1500 feet per minute is a hard jolt that can be successfully handled without injury. d. Like any hard landing the fuel should be secured and the pilot light extinguished before ground contact. There are other possible problems such as rebound that could occur. Thinking out the problem in advance of a real powerline collision threat will give the pilot more confidence to make the correct decision. Recently, two Colorado pilots were forced to jump from their balloon just before it plowed into powerlines. They were not injured, but the balloon received extensive damage. Also recently, a balloon hit a powerline in Kansas City. It was damaged, but there were no injuries to the balloonists. And in east Texas, a balloon recently deflated across powerlines at sundown. The pilot received minor burns and so did the balloon, but the two passengers escaped uninjured. Again in east Texas, a balloon was caught in the wind shear during a landing in a new subdivision and became entangled in some wires that fortunately were not alive with electricity. There were no damages or injuries. A balloonist and his passenger were not so lucky in Wichita last month. They were killed when their superpressurized balloon broke its tether and sailed off into powerlines. When a long electrical cord hanging down from the basket contacted 69 KV lines, the two occupants suffered severe electrical burns, became unconscious, fell out of the basket, and were pronounced dead by electrocution. Each of these powerline accidents has its own set of circumstances and causes for happening. Regardless, each deals a severe blow to the safety record of the entire ballooning community. For this reason, if for no other, it is paramount that all pilots take steps to avoid collision with powerlines. Towards this goal, some advice and discussion is offered through this newsletter media. Just what can happen? If a balloon contacts powerlines at the basket, it is possible that the occupants touching any part of the metal superstructure or fuel system can be electrocuted. Such contact could also result in fire and explosion if hot wires penetrate a tank or fuel line. If a balloon makes contact with its suspension cables, the resultant arcing can sever the cables. The occupants are left in free fall, either with the basket or on their own. Contact at the envelope may cause fabric melting, partial deflation and some electrical power transmission to the basket by way of the rip line, damp load tapes, or the pyrometer cable. All of these accidents can be avoided if proper care and precautions are taken. During launching, powerlines are avoidable simply by launching downwind of the wires or at a safe distance upwind of the wires. This is just common sense and applies to tethering as well. For crossing powerlines downwind of the launch site, a good rule of thumb is to allow at least 100 feet of horizontal separation between the lines and the balloon for each knot of wind speed. For example, in a 10 knot surface wind, the launch site should be at least 1,000 feet upwind. But be conservative in your estimates - 1500 feet would be even better. The actual crossing should be made with several hundred feet of vertical clearance. It is even advisable to cross the line in an ascent. Pay attention to how heavily loaded the balloon is and quickly assess your balloon's ability to climb under the current conditions. Overloaded balloons tend to be sluggish and very slow reacting. Don't forget - an average balloon has over two tons of inertia! Do not attempt landings upwind of powerlines without employing the above distance minimums. Better yet, it just makes good sense not to make landings upwind of powerlines at all; instead, cross them at a safe altitude and select a more appropriate landing site. If winds are gusty, thermic or otherwise unstable, be especially cautious. Under such conditions, the direction and altitude of the balloon can change abruptly and safety margins can dwindle in seconds. In level flight, keep a constant vigil for powerlines. They are not easy to see from the air, especially when viewed against a mixed background of earth and vegetation. If the wind dies and the balloon is suddenly becalmed over powerlines, climb to a higher altitude to find a wind that will move the balloon aside. If no such lateral movement is discovered, carefully use a drop line and an experienced ground crew to pull the balloon out of danger. Keep in mind that hemp and nylon, under certain conditions, have been known to conduct over 500 volts. Whenever ballooning in the vicinity of powerlines, use every precaution possible. Don't take chances. Don't tempt the destructive potential (no pun intended) of such innocent looking wires. Things can happen very quickly and a not so bad situation can rapidly deteriorate into a gruesome ordeal. Balloonists right now are pushing their luck. Flights are getting sloppy and accidents are happening. For your own safety, the safety of your trusting passengers, and the reputation of the great sport of ballooning, be more careful. To avoid tragic weather related experiences in ballooning, it helps to have some knowledge of summer thunderstorms and thermals. Never attempt the destructive potential of either phenomenon. At 12,000 to 16,000 feet, small cumulus (building) clouds of summer flourish and grow rapidly to large towering (20,000 to 60,000 feet) cumulonimbus thunderstorm clouds. Surprisingly, an afternoon thermal or small orographic disturbance can trigger the development of a thunderstorm by initiating the rise of warm moist air. Most severe thunderstorm development occurs along or just ahead of summer cold fronts. They materialize in a squall line several hundred miles long at times. Invariably, there is a continuous line of strong gusty winds, violent updrafts and downdrafts sometimes in excess of several thousand feet per minute, wind shear turbulence, thunder roll, lightning strokes, hail, heavy rainfall, and even flash floods. Some of the more ferocious storms also spawn tornadoes. Obviously, these are not conditions suitable for balloon flying. It should be noted that there is still much unknown about just how thunderstorms operate. For instance, scientists still do not fully understand what causes lightning and its close association with rain. Some think lightning serves as a catalyst in the formation of rain while others believe that the rapid descent of charged rain or hall generates lightning. Here in the U.S., winds gusting to 60 and 70 mph are often observed, usually moving from west to east or from northwest to southeast. Radar studies show the thunderstorm life cycle, from start of growth through maturity to dissipation, to be very short and somewhat complex. It is difficult to forecast and communicate short term storm details to remote locations - often the locations where ballooning takes place. By the very nature of the storm's behavior, one area may be missed while another may experience high winds and a torrential downpour. This is why balloonists must keep a watchful eye for a rapidly darkening western or southwestern sky followed by distant thunder and lightning, as well as local irregular shifts in wind speed and direction. Such symptoms provide approximately 30 minutes of advance warning. Dust on the horizon signals the onset of gusty surface winds of the encroaching storm determined by observing the direction of the anvil shaped cloud blowing out ahead of the system. Peak gusts of a raging thunderstorm strike abruptly and leave little time for a safe landing. Even airplanes have broken up in flight several miles from a storm, so one can just imagine what could happen to a relatively frail balloon. A thunderstorm is said to reach maturity when rain begins to fall. Since the storm is essentially vertical the falling rain penetrates the clouds and its aerodynamic drag creates downdrafts. Each drop causes more drops to precipitate and some air is dragged downward. The result is a mass of downrushing air that turns at right angles when it reaches the surface and then spreads out away from the column of heavy precipitation. Most of the downrushing air turns in the direction of the overall storm movement, creating a gust front that could cause a lot of excitement for the unwary balloon pilot. Even though thunderheads may be seen to be forming in the distance, the balloonists can easily be tempted to continue flying in gentle surface winds. However, cumulonimbus clouds can affect wind currents as far away as ten miles with abrupt changes. The balloon can actually be drawn into the storm center as warm moist air flows inward toward the rising vertical columns of air. It is therefore highly advisable to never venture closer than ten miles. Instead, land and terminate all ballooning activity for the day. Summertime is also thermal season and it would be wise for all balloonists to respect the sun-generated weather phenomenon known as the thermal. When the lower atmosphere is heated and the lapse rate of air becomes dryadiabatic, the conditions are ideal. Surfaces with low solar reflectivity and with shelter from the wind are the most likely breeding grounds. Calm conditions promote thermals by allowing more time for isolated or sheltered pockets of air to be solar-heated. Here, more heat energy is provided than the surface can absorb. The extra heat is transferred to the air by convection, causing it to become buoyant. As the bubble of superheated air rises, it displaces the air above it, forcing it into an unstable condition. Under these conditions, as thermals form, a balloon's drift may be abruptly shifted in speed and direction without a change in altitude or it may begin to trace a wide curved path. These are the first signs of thermal activity. Southeast facing slopes have greater potential for thermal development than flat terrain because of the higher sun angles, thus permitting more solar heating. Thermals, like balloons, tend to drift with the wind (so one may ride along with it for a while), but break up when the wind speed exceeds 15 - 20 knots. Like in the case of the thunderstorm, a balloon can be drawn into the center of a thermal where the action of the vortex can cause the basket to swing outward beneath the envelope as the balloon traces a spiraling path that climbs at an alarming rate, perhaps more than 1000 fpm. This is false climb since no heat was added to the envelope by the burners. The pilot must anticipate a sudden loss of lift and a potential downdraft when the balloon pops out of the thermal. Heat should be applied to offset a rapid uncontrolled descent. The flattening and distorting stresses on the top panel could cause an inadvertent ripout at high altitude or the side panels could split open. For this reason, the first sign of thermal activity should herald the end of ballooning for that day.